In case you missed it, a new Erie-based commercial began hitting the airwaves Monday, Aug. 11. And Erie-based commercials are always fun, right? We all have our favorite local Erie jingle and enjoy seeing what the creative types can come up with when they decide to market their brand. In this case, Erie Reader came up with two words to capture our brand and concept: Ghost Perry. Because really, if there's one thing Erie loves, it's Oliver Hazard Perry. Some, you might even say, are "Down wit' OHP," since folks donning shirts proclaiming it have been seen around the area. And if there's another pretty cool thing, it's turning beloved and adorable icons of historical significance into ghosts wandering around a city looking for something to do. It really does scream 'alt. weekly', doesn't it? The crew up at MoreFrames is a talented bunch. Alex Bieler wrote about them back in November 2012, an issue for which the MoreFrames designed their own cover. If you're not familiar with MoreFrames and the work they do, the world-class animators put together a slick sizzle reel a while back that captures the scope of their work (well, through 2012 -- and they've been pretty busy since then, including getting featured in Erie's 40 Under 40). If you take a look in their dossier, you'll find that they've worked for videogame franchises, like Halo; for renowned recording artists, spanning the likes of Rob & Nino and Ill Bill and Lamb of God; and for movie studios that produce awesome flicks like The Grandmaster. And they've done some work here and there for local companies, too, so that's why we were excited for the potential to work with them, because these guys are a testament to Brain Gain in Erie -- folks not from the area, who came here to get an education, and then stuck around and are contributing to a community. Who better, we figured, to partner with than young, talented, local professionals to help us deliver a product that captures our brand? 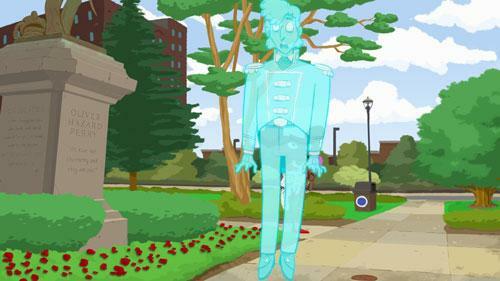 So you have a concept of Ghost Perry, fifteen seconds, a world-class animation studio, and the advertising of the Erie Reader, this is what you get. More are on the way, so keep tuned to your glowing rectangle of choice to see which ones are next. And if you're a superfan, you'll start searching for the cool Easter Eggs MoreFrames placed throughout the clip. Ben Speggen digs the new commercials and hopes you do, too. If you'd like to talk about them, the Easter Eggs, or anything else, you can reach him at bSpeggen@ErieReader.com, and you can follow him on Twitter @ERBenSpeggen.